Saturday May 4 12-6 p.m. Many Grand Opening festivities for this Family fun and kid friendly event. 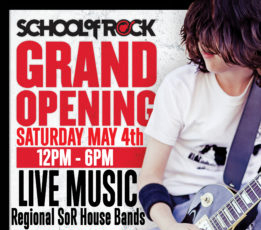 Regional School of Rock House bands will be performing LIVE. Ribbon Cutting and Guitar smashing ceremony. Free Trial Lessons. Tour of School of Rock Alexandria. Guitar & Amp Raffle. Rockin Photo Ops. Special discounts on Programs and Camps. Food and fun!